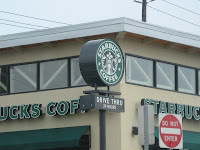 24-hour, drive-through Starbucks? Yes, please! 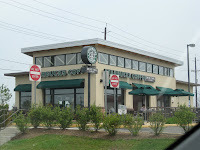 I was traversing the better part of Western New Jersey today when, on Route 18, I spotted a Starbucks. Not atypical, considering there are a few thousands locations nationwide. But this one, this one is special: It’s open 24 hours and you don’t have to get out of the car to get your coffee. WOW. If I lived nearby, I would be a changed person. Considering I don’t, I merely dream of the day when my 2 a.m. Starbucks cravings kick in and I can actually satisfy them. These were taken from inside my car, I apologize. I had already gotten my iced peppermint mocha with soy at a different location. In a full-page advertisment featured in today’s copy of The New York Times, Starbucks announced they will be serving a new daily brew starting tomorrow, April 8. Pike Place Roast, 37 years in the making, will be revealed at all Starbucks locations at noon. Their Web site does not announce just what the “big surprise” is. Neither did mass e-mails sent to all Internet subscribers. I am intrigued as to just what is going to happen at noon, also what the new roast tastes like. I suspect free coffee will be served tomorrow to promote the few flavor. Just a guess. 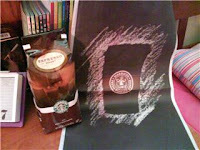 Pick up a copy of the Times to see the “Venti big” surprise or visit the Starbucks Web site.